I found this technique about 4 or 5 years ago and have been using it ever since. Instead of keeping a traditional list, start with a blank sheet and make each to-do item a bubble. The size of the bubble corresponds to its importance or urgency. If a task is really important, it gets a larger bubble. An less important to-do task, conversely gets a smaller bubble. I find it reduces a lot of stress to take something out of the "worry bin" in my mind and put it down on paper. 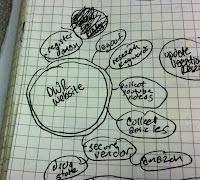 And it is very satisfying to scribble out a bubble of a completed task. Frequency: Review the current Bubble Map every morning. I make new one twice a week. During the week, I work on the "worky" tasks, or stuff that is required to occur during business hours. On Thursday or Friday, I make a new one that lists the business stuff for the following week, but also usually has the personal stuff I need to do over the weekend. This helps re-focus on must-dos before the week is over. Updating: When making a new Bubble Map, I start by copying over the yet-unfinished stuff from the most recent Bubble Map. This allows me to re-evaluate the relative importance of the uncompleted task and re-draw it to the appropriate size on the new Bubble Chart. Sometimes X-ing out the old task once it has been moved to the new Bubble Chart. Clustering: I group sub-tasks related to the same overall outcome in a cluster. The main outcome gets a bold or double-lined ring around it and the subordinate tasks are drawn in chains according to the order that they need to get done in. When you're done with the whole project, make it one big bubble and mark it out! Tagging: Having dabbled in David Allen's Getting Things Done (GTD) method, I sometimes add tags to the bubbles for context and other meaning. If I'm waiting for someone or more info before something can get done, I add a little box with a W in it. If something needs to be scheduled or added to a calendar, I put a C in the tag box. Stuff that needs to wait till payday gets a $. Zoning: I separate the bubbles into zones. 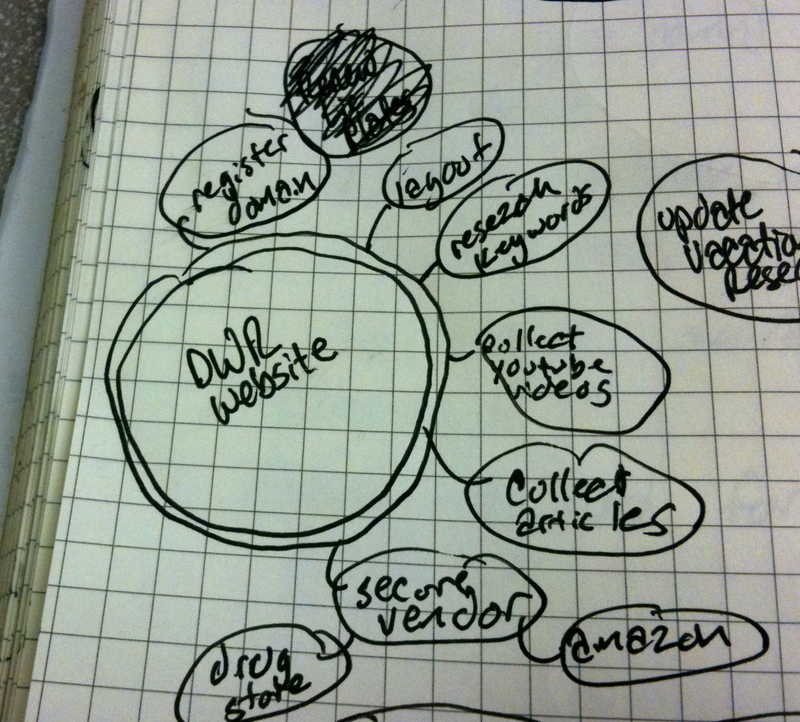 I put client task bubbles in one area, employer tasks in another, and general life to-dos in their own area. This helps connect related tasks. Recurring: For recurring things, the bubbles go in a row. For instance, if you want to work out three times that week, put the three bubbles next to each other. It becomes a little progress bar. Of all the new-work, hipster, life-hackity practices I have tried over the last few years, this one sticks the most. It fits my personality and the way I digest information (visually). It really does reduce stress levels. As I make a new map, I imagine I'm Dumbledore, pulling a worry or out of my head and safely committing it to my Bubble map, as my stress level lessens with each Bubble. Happy Bubbling!